IMs rule Mérida Tourney… GM norm for Simutowe? When one looks at the field for the Carlos Torre Memorial Mérida Tournament in Yucatán, México, one would think that with players like Alexij Dreev (2705 RUS), Boris Gelfand (2703 ISR), Dieter Nisipeanu (2675 ROM), Valerij Filippov (2630 RUS), Thomas Luther (2580 GER), Vadim Milov (2574 SUI) and Gilberto Hernandez (2538 MEX) other less-established players would not have a chance. This tournament certainly proved otherwise! There were polls taken on the main tournament website asking for predictions of the winner. It is safe to say that no one got this one right! The surprising winner of the tournament was 2475-rated "GM-killer" from Cuba named IM Yuniesky Quesada (pictured right). The 19-year old star beat the following strong GMs enroute to win his title and a GM norm: Luther (3-2), Nisipeanu (3-2), Gelfand (1½-½) and Filippov (1½-½). In an enterprising format, the Mérida tournament featured a "Wimbledon Knockout" feature in which the top 12 players from the Magistral section joined four strong GMs in an exciting series of matches. The losers would continue on in the Magistral tourney (which Milov eventually won). In the knockout rounds, two 90-minute games per match would be played. In the event of a tie, two 15-minute matches would be played. The final tiebreaker would be one 5-minute game (with draw odds for black). After the first six rounds of the preliminary, GM Vadim Milov lead the field with 5½-½ points and was followed by Gilberto Hernandez and a hungry pack of International Masters including Zambia's Amon Simutowe. The knockout pairings appeared to favor the Grandmasters as the rating differences were no less than 100 ELO points and as high as 230! What would happen next may be unprecedented. The International Masters scored four upset victories over GMs in the first eight knockout matches. Besides Quesada's win over Thomas Luther, Simutowe scored a 2-0 drubbing of Milov. 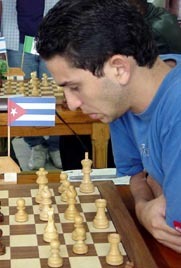 Mexico-based Cuban IM Dionisio Aldama dominated play against 15-year old GM-elect Alejandro Ramirez winning 1½-½. Perhaps the biggest upset was IM Rafael Espinosa's 1½-½ win over top-seed Alexij Dreev, a 230-point rating difference. A GM norm for Simutowe? Simutowe put together a string of victories in both the preliminary rounds and defeated Milov in the knockout before losing his match to Filippov. Simutowe had drawn Filippov two years ago in the Bäd Worishofen tournament, but was unable to hold the balance. He ended with a 7-3 score. 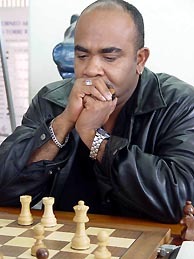 There now is a question of whether the Zambian national earned his 3rd and final GM norm. "If one exceeds the requirement by ½-point, they give a norm as an exception if he does not meet the three GMs opposition requirement. The chief Arbiter indicated they changed this because some countries used to invite GMs for matches and pay them to lose a number of matches with one player." So the jury is out on whether Simutowe has earned a GM result. Let us hope that the official decision will be conclusive and precise. 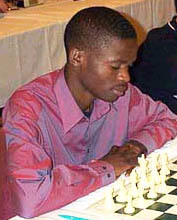 Nevertheless, the young Zambian's games are showing a type of energy that was seen in his games two years ago when he stormed onto the international scene and reached a 2470 rating. Hopefully, we will see more of the same in 2004! Federación Nacional de Ajedrez de México, A.C.
by Instituto del Deporte del Estado de Yucatán.